The player with the most rushing titles is Jim Brown, who was the rushing champion eight times over his career. Eric Dickerson, Emmitt Smith, O. J. Simpson, Steve Van Buren, and Barry Sanders are tied for the second-most rushing titles, each having won four times. Jim Brown also holds the record for the most consecutive rushing titles with five, having led the league in rushing each year from 1957 to 1961. Steve Van Buren, Emmitt Smith, and Earl Campbell each recorded three consecutive rushing titles. The Cleveland Browns have recorded the most rushing titles with eleven; the Dallas Cowboys rank second, with seven rushing titles. The most recent rushing champion is Ezekiel Elliott of the Dallas Cowboys, who led the league with 1,434 yards rushing over the 2018 season. Buffalo Bills' O. J. Simpson pictured in the game where he became the first running back to gain over 2,000 yards in a season on Dec. 16, 1973. 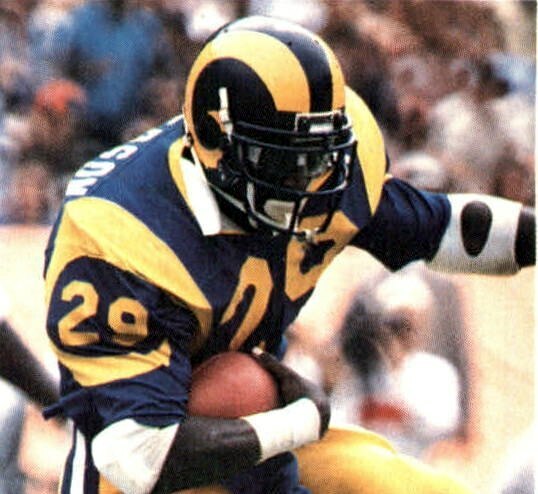 Simpson led the NFL in rushing in 1972, 1973, 1975, and 1976. ^ The NFL did not have a set number of games for teams to play until the 1935 season, instead setting a minimum. ^ The 1982 season was reduced from 16 to 9 games due to a 57-day players' strike. ^ The 1987 season was reduced from 16 to 15 games due to a 24-day players' strike. ^ a b "Beginner's Guide to Football". National Football League. Retrieved September 30, 2012. ^ "The Run". NFL360.com. Retrieved June 19, 2013. ^ "Miami's Bush eyeing NFL rushing title". Foxsports.com. August 16, 2012. Retrieved June 19, 2013. ^ "2012 NFL Record and Fact Book" (PDF). NFL.com. pp. 625–626. Retrieved June 19, 2013. ^ "1932 Boston Braves". Pro-Football-Reference.com. Retrieved June 16, 2013. ^ "1933 Boston Redskins". Pro-Football-Reference.com. Retrieved June 16, 2013. ^ "1934 Chicago Bears". Pro-Football-Reference.com. Retrieved June 16, 2013. ^ a b "NFL History by Decade: 1981-1990". NFL.com. Retrieved February 27, 2013. Barry Sanders (born July 16, 1968) is a former American football running back. He played professionally for the Detroit Lions of the National Football League (NFL). A Pro Bowl invitee in each of his ten NFL seasons and two-time NFL Offensive Player of the Year, Sanders led the league in rushing yards four times and established himself as one of the most elusive runners in pro football with his quickness and agility. In 2007, he was ranked by NFL Network's NFL Top 10 series as the most elusive runner in NFL history, and also topped its list of greatest players never to play in a Super Bowl. He is often regarded as one of the greatest running backs in NFL history. Sanders played college football for the Oklahoma State Cowboys football team, where, as a junior in 1988 he compiled what is considered one of the greatest individual seasons in college football history, rushing for 2,850 yards and 42 touchdowns in 12 games. He was awarded the Heisman Trophy as the most outstanding college player in the nation and was unanimously recognized as an All-American. He was inducted into the College Football Hall of Fame in 2003. Sanders joined the Lions in 1989 and had an immediate impact, winning the NFL's Rookie of the Year award. Through ten seasons in Detroit, he averaged over 1,500 rushing yards per season and just under 100 rushing yards per game. In 1997, he became the third player to rush for over 2,000 yards in a season and was named the NFL Most Valuable Player. Still seemingly in his prime, Sanders unexpectedly retired from football after the 1998 season, 1,457 yards short of breaking the NFL's all-time rushing record. His number 20 jersey was retired by the Lions, and he was inducted into the Pro Football Hall of Fame in 2004. In American football and Canadian football, a carry or rushing attempt is a statistical term equivalent to a single rushing play. The term is typically used in reference to "yards per carry", meaning yards per attempt rushing the ball. Although running backs are typically tasked with carrying the ball, any offensive player who performs a carry is known as a ball-carrier for that play, regardless of position. The yards gained on a carry are referred to as rushing yards. In the National Football League (NFL), Emmitt Smith holds the record for the most career carries, with 4,409. The current leader in yards-per-carry in NFL history with at least 750 carries is quarterback Michael Vick.The statistical treatment of yardage lost on sacks differs between the NCAA and NFL. Under NCAA rules, sacks count as rushing yards for both the player and his team. In the NFL, sacks are not counted in the quarterback's passing or rushing yardage, but are counted as part of the team's passing yardage. Smith grew up in Pensacola, Florida and became the second-leading rusher in American high school football history while playing for Escambia High School. Smith then attended the University of Florida, where he set numerous school rushing records over a three-year college career with the Florida Gators. After being named a unanimous All-American in 1989, Smith chose to forgo his senior year of eligibility and play professionally. He came back and completed his college coursework, graduating from the University of Florida in 1996. The Dallas Cowboys selected Smith in the first round of the 1990 NFL draft. During his long professional career, he became the NFL's all-time rushing leader with 18,355 yards, breaking the record formerly held by Walter Payton, and played for three Super Bowl-winning Dallas Cowboys teams. He also holds the record for career rushing touchdowns with 164. Smith is the only running back to ever win a Super Bowl championship, the NFL Most Valuable Player award, the NFL rushing crown, and the Super Bowl Most Valuable Player award all in the same season (1993). He is also one of four running backs to lead the NFL in rushing three or more consecutive seasons, joining Steve Van Buren, Jim Brown and Earl Campbell. Smith led the league in rushing and won the Super Bowl in the same year three times (1992, 1993, and 1995) when to that point it had never been done. Smith is also one of only two non-kickers in NFL history to score more than 1,000 career points (the other being Jerry Rice). Smith was inducted into the Pro Football Hall of Fame in 2010 and the College Football Hall of Fame in 2006. Smith played thirteen seasons with the Cowboys and two with the Arizona Cardinals. While playing for Dallas, Smith plus quarterback Troy Aikman and wide receiver Michael Irvin were known as "The Triplets," and they led their team to three Super Bowl championships during the 1990s. James Nathaniel Brown (born February 17, 1936) is a former professional American football player and actor. He was a running back for the Cleveland Browns of the National Football League (NFL) from 1957 through 1965. Considered to be one of the greatest football players of all time, Brown was a Pro Bowl invitee every season he was in the league, was recognized as the AP NFL Most Valuable Player three times, and won an NFL championship with the Browns in 1964. He led the league in rushing yards in eight out of his nine seasons, and by the time he retired, he had shattered most major rushing records. In 2002, he was named by The Sporting News as the greatest professional football player ever.Brown earned unanimous All-America honors playing college football at Syracuse University in New York, where he was an all-around player for the Syracuse Orangemen football team. He also excelled in basketball, track and field, and lacrosse. The football team later retired his number 44 jersey. He was inducted into the College Football Hall of Fame in 1995. In his professional career, Brown carried the ball 2,359 times for 12,312 rushing yards and 106 touchdowns, which were all records when he retired. He averaged 104.1 rushing yards per game, and is the only player in NFL history to average over 100 rushing yards per game for his career. His 5.2 yards per rush is second-best among running backs. Brown was enshrined in the Pro Football Hall of Fame in 1971. He was named to the NFL 75th Anniversary All-Time Team, comprising the best players in NFL history. His number 32 jersey is retired by the Browns. Shortly after his football career, Brown became an actor, and had several leading roles throughout the 1970s. In its ten years of existence, two American Football League (AFL) rushing yards leaders were also AFL Rookies of the Year: The Dallas Texans' Abner Haynes in 1960, and the San Diego Chargers' Dickie Post in 1969. Only two men won the rushing crown twice: the Buffalo Bills' Cookie Gilchrist in 1962 and 1964, and the Boston Patriots' Jim Nance, in 1966 and 1967. All years had fourteen regular-season games. The list of college football yearly rushing leaders identifies the major college rushing leaders for each season from 1937 to the present. It includes yearly leaders in three statistical categories: (1) rushing yardage; (2) yards per carry; and (3) rushing touchdowns. This is a list of National Football League running backs by total career rushing yards. This list includes all running backs who have rushed for at least 10,000 yards. Emmitt Smith has held the all-time rushing yards record since 2002. Allen is considered one of the greatest goal line and short-yard runners in National Football League (NFL) history.His younger brother, Damon Allen, played quarterback for 23 seasons in the Canadian Football League, was named to the Canadian Football Hall of Fame in 2012 and was professional football's all-time leader in passing yards.